Lateral view of a 3D volume-rendered reconstruction of the hemipelvis with the femur removed. Red arrow denotes oblique fracture through the posterior wall. Sagittal CT image through the left acetabulum, lateral to medial. 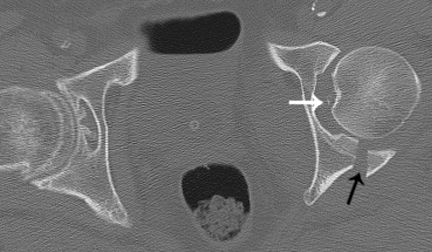 Black arrows denote displaced posterior wall fracture fragment. Sagittal CT image through the left acetabulum, lateral to medial. The anterior and posterior columns are intact. Isolated posterior wall fractures are the simplest and also represent one of the most common (13 - 27%) acetabular fractures. The fracture plane travels through the posterior wall and does not involve either column. Therefore, the iliopectineal and ilioischial lines are intact on radiographs. On axial images, the key section is through the acetabular tectum, which demonstrates an obliquely-oriented fracture line coursing anterolaterally in the posterior aspect. Isolated fractures do not extend superiorly into the iliac wing or inferior down the ischial body. 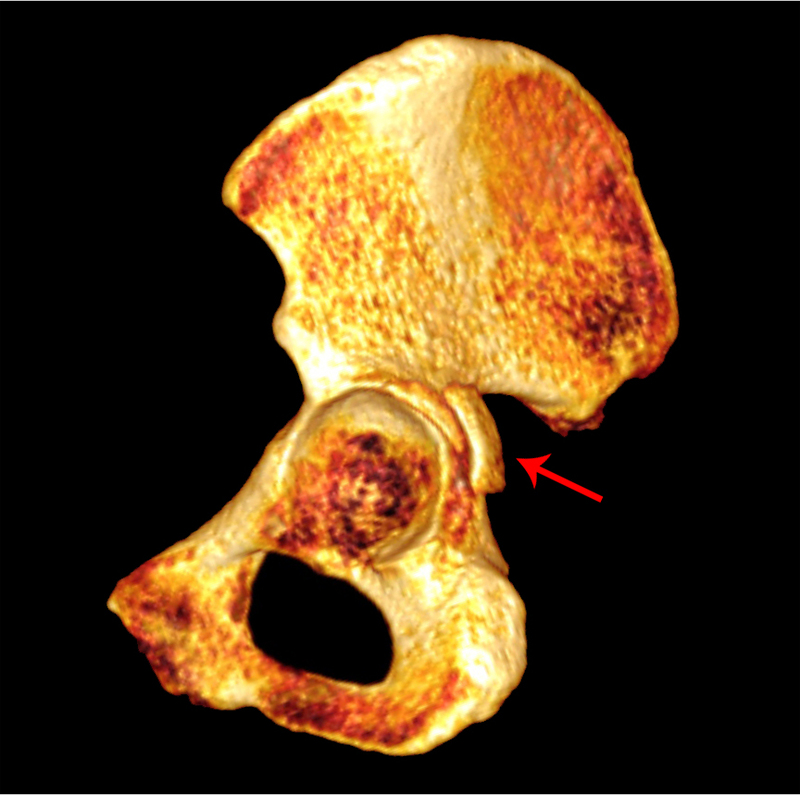 This type of fracture is often associated with posterior hip dislocations, although the hip may have been reduced by the time the patient is imaged. Similar to dislocations of the shoulder, an impaction fracture of the femoral head may be present. In addition, fragments may become entrapped in the hip joint, especially in cases of difficult or failed closed reductions. Noting intra-articular fragments is important because the acetabulum can often be restored without exposing the hip joint, and therefore not examined intra-operatively. A missed intra-articular fragment can act as a loose body and lead to early osteoarthritis. 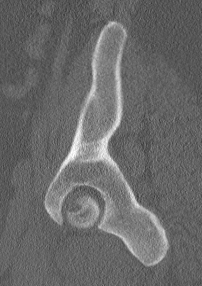 Axial CT image through the mid acetabulum. 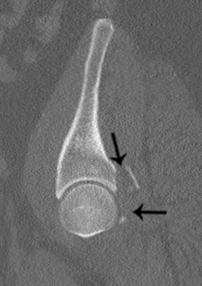 White arrow denotes an entrapped intra-articular fracture fragment. 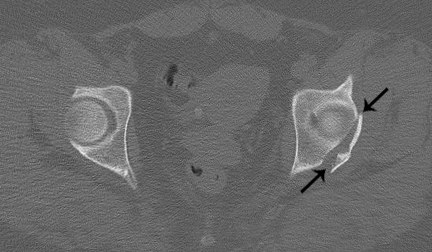 Black arrow indicates oblique plane of the posterior wall fracture.